Last weekend TD and I attended the wedding of our friends Megan Wolff and Bob Harvey at the Mohonk Mountain House located about two hours north of New York City near the Catskill Mountains. I had heard about the resort before but had never been there. It was built in 1869 by Albert Smiley and still today the property is run by the Smiley family. 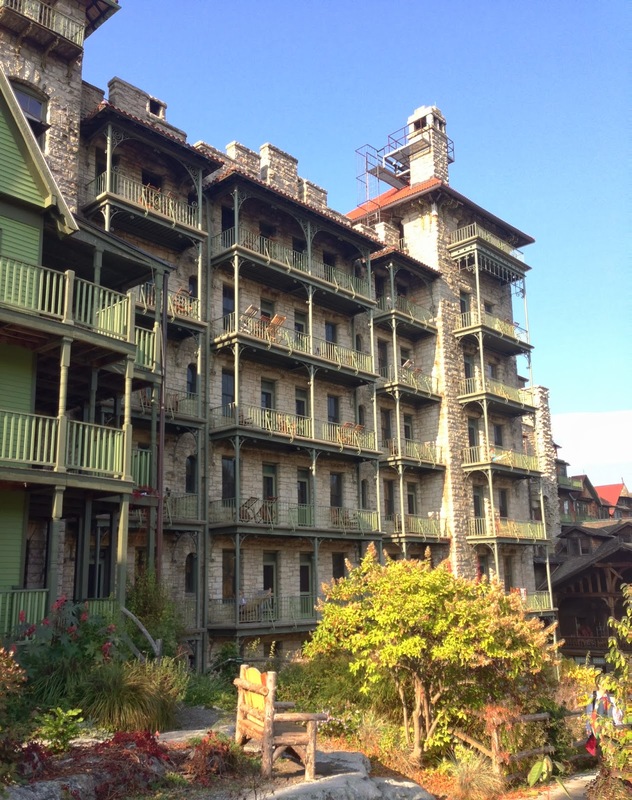 At its center is the hotel lodge, a seven-story, turreted Victorian castle. Most of the hotel rooms have wood-burning fireplaces and small balconies. Lake Mohonk and the surrounding 40,000 acres offer all kinds of recreation including boating, hiking, golf, tennis, horse back riding, and ice skating. We were excited to see it and celebrate our friends' wedding. From Grand Central Station we took the train up to Poughkeepsie. The train ride from New York to Albany hugs the shore of the Hudson River, and the land around remains largely undeveloped. It has to be one of the prettiest train rides in America. And a nice way to decompress. 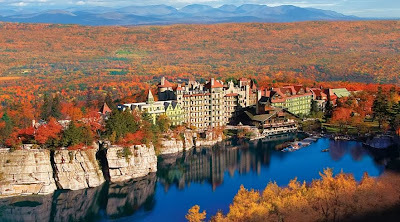 From the train station in Poughkeepsie we took a cab to the Mohonk Mountain House. When you get to the beginning of the property you drive through a entrance gate house and then along a long, winding, curving, one-way road to the hotel. It must have taken forever in a horse-drawn carriage before the invention of cars. We checked into our charming room which was perched over the Mohonk Lake below. We had a little time before the wedding so we quickly investigated. 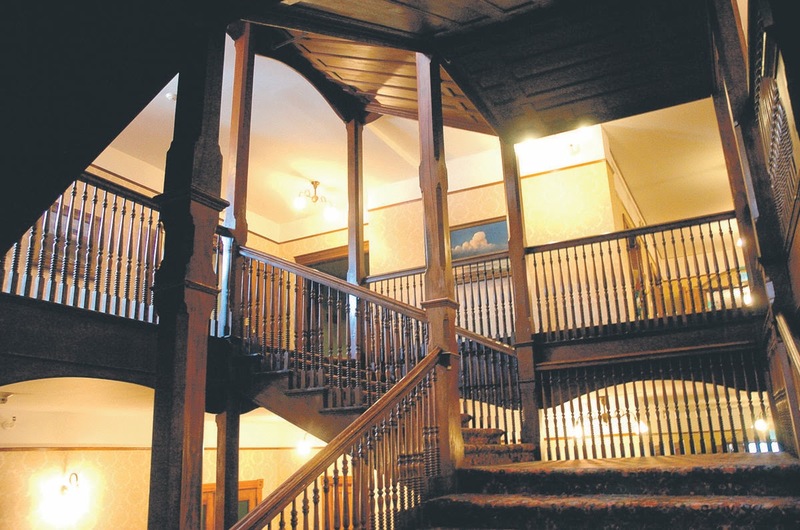 I loved the Victorian interior of the hotel with its original wood work, antique furnishings, long carpeted muffled halls, and big windows that look out to the surrounding land. It reminded me of other places we have been including the Inn at Cooperstown, the Lake George Club where my cousin Lindsay got married, and of course 611, our family Victorian homestead that my grandmother grew up in. This upstate New York Victorian style is in my blood. A big beautiful garden was planted in a spectrum of bright colors. Adjacent to the garden was an evergreen maze – very Harry Potter. Beyond the flower garden Megan and Bob were married in an outdoor ceremony officiated by our friend the Reverend Donna Schaper from Judson Memorial Church. 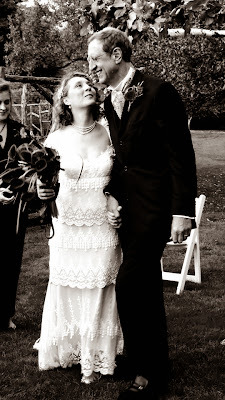 There was lovely music, readings, shared vows, and a chirping bird in a nearby tree. Very best wishes to the bride and groom for all good things that are to come! After the ceremony we walked back to the Mountain House for cocktails on the porch and a lively dinner reception. It was a very fun night. The next day unfortunately was rainy and foggy (welcome to upstate New York). But it gave us the opportunity to sample the delicious buffet meals and investigate further the antique-decorated interiors. A framed picture showed the John D. Rockefeller family visiting the hotel. The Marketing Department – nice place to work. We had a relaxing swim in the big, warm pool where soothing music played overhead. Soon it was time to leave our nineteenth century retreat and return to the world. It was a magical visit to a romantic era, far removed from television and the computer. Kudos to the Smiley family for keeping everything so beautifully preserved and restored in its original state. Thank you Megan and Bob for inviting us to this special place! I also loved your pictures, and was reminded of happy times in upper New York State. So tempting, would love to visit there!